Think back to your childhood, whether you had a treehouse of your own or were jealous of a kid who did, you have to admit that there is something seriously magical about treehouses. If your garage has a strong, sturdy tree in it that is just standing there, perhaps building a treehouse around it could make a fun DIY project. Regardless of whether you have kids or not, a treehouse could make a fantastic addition to your garden and your home. Not sure where you would start with a treehouse? Don’t worry, because below are a selection of handy tips for treehouse building, including everything that you need to know, from how to choose the perfect tree to how to design your treehouse and ensure that it is safe to use. For everything that you need to know, read on. Like with any DIY project, the first step that you need to take is to get inspired. Because, if you don’t have inspiration when it comes to the designing part of your project, you will struggle. Now, the fantastic things about treehouses is how unique they can be - there are so many different designs and ideas for treehouses, that you have plenty of options. One of the best places to get inspired is on Pinterest, as there are so many incredible ideas on here. Whether you want to create a low-height treehouse for your kids to play in, a treehouse to double as a home office, or a treehouse that can act as a fully functional guest bedroom, there are plenty of ideas to choose from. When it comes to building your treehouse, there is a lot that you need to take into consideration. With that in mind, below is a guide to the various factors that need to be taken into account when building a treehouse. Think about the right location: The first thing that it is vital that you think about is the location in your garden where you build your treehouse. For maximum support, choose a healthy, hardwood tree, that has a long lifespan. It is vital to pick a tree that has load-bearing branches of at least eight inches in width. The best trees to use are maple, oak, and fir, as these tend to be the strongest. When it comes to the weight and stability of your treehouse, it is vital to get the construction right. With this in mind, aim to build the treehouse as close to the trunk as possible, with diagonal bracing coming from underneath the platform. For larger and heavier treehouses, consider spreading them across three or four trees. Take the tree into account too, you want to build your treehouse platform as close to the trunk of the tree as possible, it is vital that you leave enough room for tree growth and movement. Don’t constrict the tree's trunk or branches with ropes or wires, make sure to leave plenty of room for movement, so that the tree can naturally grow. To ensure that your treehouse is stable, it is vital that you centre the load over the trunk and spread the weight across a range of branches. When it comes to the floor of your treehouse, it is crucial that you build it level, as this makes it easier to construct the rest of the structure. Also, a word to the wise, use high-quality timber, such as what George Hill Timber offers, to ensure that the structure is both strong and sturdy. Accessorize your treehouse: Once your treehouse is complete, the next step is to personalise it. Aside from painting the structure, you can also find other simple ways to accessorize it, depending of course on who it is for. For children, accessorize like zip lines, rope swings, and a telescope are ideal, for an adult structure, think about creating a relaxed and tranquil vibe and turn the space into a retreat. There you have it, a guide to everything that you need to know about designing and building a treehouse in your back garden. 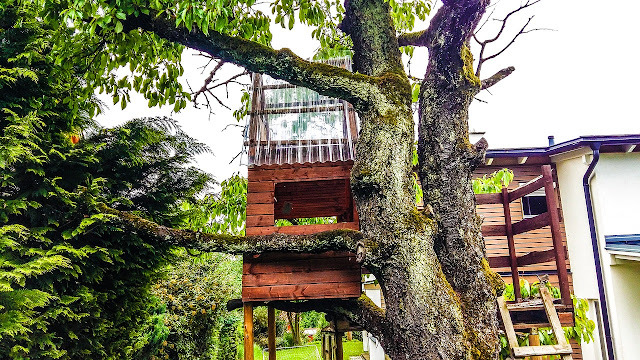 Whether it is a treehouse for your children or to use as a workspace or a guest bedroom (yes, really) it doesn’t matter, the tips above will help you to create the ultimate treetop escape. Take these on board and implement them, and you can ensure that any treehouse you create is a fun and safe place to be.